Hide deals from seller "Tissue Boutique"
Click 'Get It' and select either $10 option, $20 option, $25 option or $50 option. Limit 1 per person. Not valid toward jewelry. Promotional value expires 365 days after purchase. $5 for $10 worth of merchandise. $10 for $20 worth of merchandise. $12 for $25 worth of furniture and household items. $25 for $50 worth of furniture and household items. Tissue Boutique is loaded with quality items at discounted prices. New and used apparel and accessories are stocked plentifully here. In addition to the great selection of apparel, Tissue Boutique offers antiques and vintage furniture to outfit your home. Their selection is in constant rotation, thanks to the owner’s commitment to providing customers with variety. Plus, their staff puts an emphasis on personalized customer service, ensuring you'll find fashionable items for your home and wardrobe with this deal. 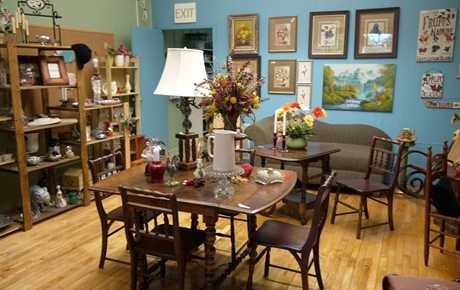 Boutique in Villa Park featuring new and used clothing, accessories, antiques and vintage furniture.